The CBS hit drama series The “Good Wife” returned for its fourth season on September 30. I don’t know about you, but we’ve been missing our weekly dose of Alicia and Kalinda. So far, season 4 has been off to a great start and we finally got to meet Kalinda’s ex-husband, Nick!! From time to time, we are privy to some inside information here at the Charles P Rogers blog. This week, we have a hot tip and couldn’t resist sharing our excitement about an upcoming episode of the Good Wife. Episode 3, which airs THIS SUNDAY, will feature our very own Tansy headboard that was purchased by the set designer back in July. It’s absolutely stunning! 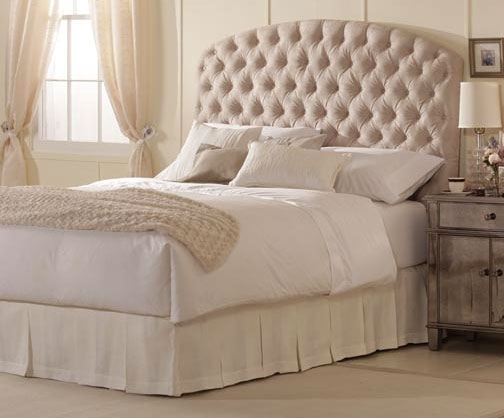 Upholstered cream microfiber with hand-tufted buttons, it’s sure to add some style to the set. If you’re considering getting one of our Tansy beds for yourself, you can also get the headboard complete with matching platform; it looks even better in person! We can’t give you many more details about the upcoming episode, but given what happened in episode 2, “50 Shades of Ice Cream” that some critics are calling it the most scandalous scene in the history of network television, we’re sure you don’t need any more reason to tune in this week. If you catch our bed this Sunday, let us know in the comments below. We’d love to hear from you!